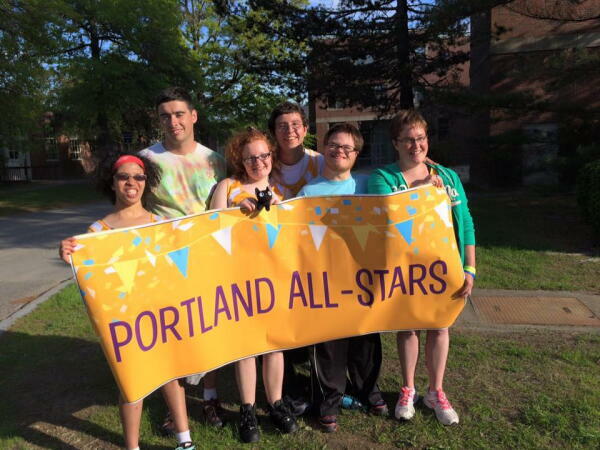 The Portland All Stars is a team of 8 to 10 young adults who are participating in Special Olympics this spring and summer. Most of the team are graduates of STRIVE U and live independently in Portland. They are training to prepare for competition at the Maine Summer Games, to be held June 9-11 at U Maine in Orono. We are in need of volunteers to help out on Sunday mornings, when we practice at the Portland High School track. The All Stars have a wide range of abilities, and we need more than one coach to help each individual achieve his or her goals in Special Olympics. All of the All Stars run races of various distances from 100 yards up to 1 mile, and many of them also complete in field events including long jump (and even shot put). To volunteer, you will need to register here! The only other thing we need is for you to be at the Portland High School track this Sunday morning at 8:00, and each Sunday from April 9ththrough June 4th. I promise you, you will not find a more rewarding thing to do on Sunday mornings this spring! Please contact George Houk at gwhouk4@gmail.com if you are interested in volunteering. OR just show up this Sunday!